Rail road bridge over Sumneytown Pike in July 2009. 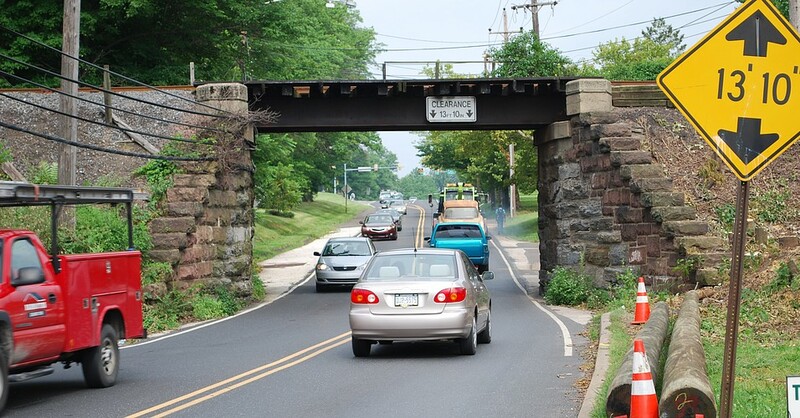 This bridge carries the single track of the old Reading Railroad's "Stony Creek Line," which starts in Norristown and ends in Lansdale. The line opened in 1873 and initially had passenger and freight service. The bridge spans the "Sumneytown and Springhouse Turnpike" (incorporated in 1848) just above the "West Point Turnpike" at a place named Kneedlers. A round trip ticket from West Point to Norristown and back was 36 cents. The end of the line for passenger service was Kneedler's Station, a mile past the West Point stop and within yards of the bridge above. The complete 11 mile trip, from Norristown to Kneedler's, took 33 minutes. 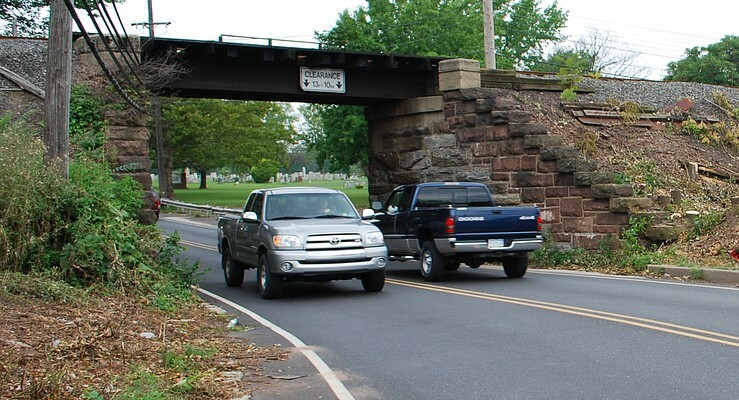 As Sumneytown Pike was improved and widened over the decades, the bridge became a bottleneck to traffic. 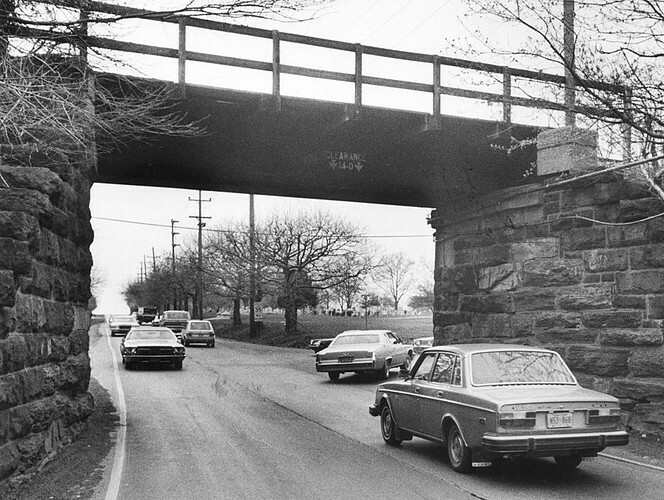 In this photo from the 1970s the bridge clearance is 14 feet. 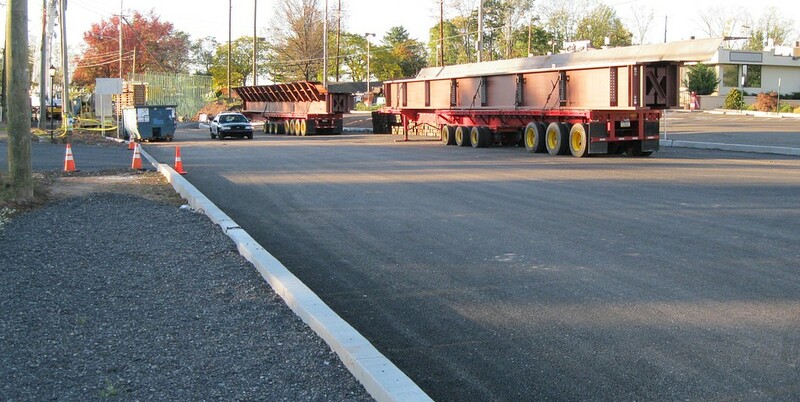 In 2010 it was 13 feet 10 inches, due to 2 more inches of asphalt applied to the pike. It would not be surprising to find the original clearance was 15 feet or more. This is the second bridge over Sumneytown Pike at this spot. According to the Ambler Gazette, November 11, 1914, it was decided a higher and wider bridge was needed. Construction was in progress by February of 1915 to replace the first one. The Ford Model T was to revolutionize the automobile industry starting in 1908 but the automobile had absolutely nothing to do with the design of the bridge. Why then was it built to such dimensions that automobile traffic could pass under it in two directions into the 21st Century? The bridge was designed and constructed so that a hay wagon could easily pass under it! The destination - Lesher Mattern's Hay Press at the West Point Feed House. Mattern would then use the very train that passed over the bridge to ship his baled hay out to various markets. 1970s traffic on Sumneytown Pike in a picture taken from the bridge. Allentown Road is to the right. Traffic in the 2000s was even worse. 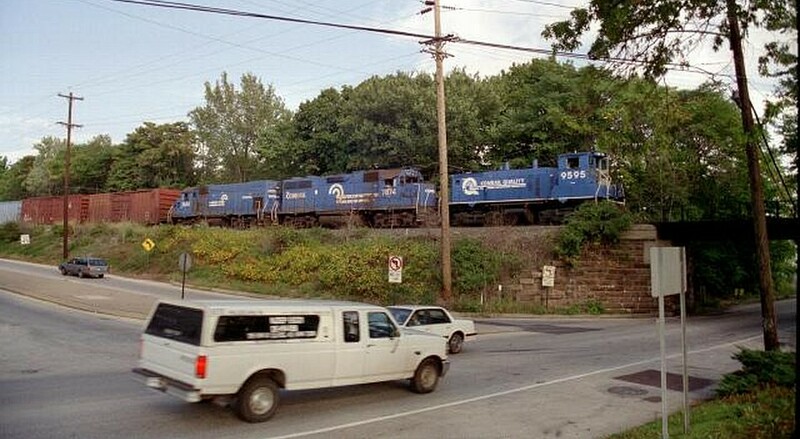 CSX crossing the bridge on the Stony Creek Line in 1995. Allentown Road is to the left. The top of the bridge in 2009. Every time Sumneytown Pike was improved or paved, the bridge seemed to shrink in width. To make matters worse, there was a bend in the road right under it, so motorists weren't able to see traffic conditions ahead until they got to it. Bicyclists riding the shoulder had to time their passage under the tracks with a break in the automobile traffic or risk a catastrophe. 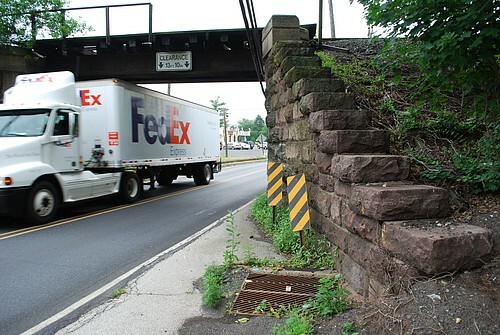 In 2009, Township Manager Len Perrone and Upper Gwynedd Township Commissioners launched an ambitious plan of reconstruction to alleviate the traffic situation on Sumneytown Pike. On March 1, 2010 the second phase of the plan began. Sumneytown Pike was closed and work was begun to replace the bridge, widen a mile long stretch of the pike and move Allentown Road. Shown above, the new bridge deck arrived by truck, partially assembled. 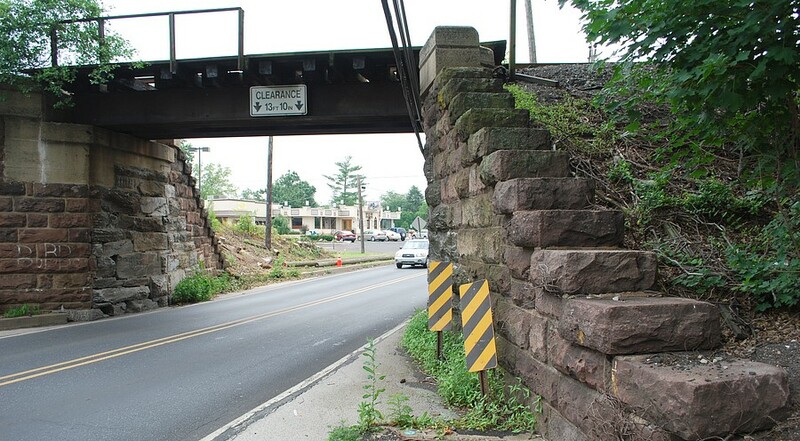 Motorists may remember that in an unfortunate coincidence, the State decided at this very time to close Morris Road and replace the bridge over the Pennsylvania Turnpike. This resulted in terrible traffic conditions for months. Looking south on Sumneytown Pike in 2012. There is now a sidewalk on the right for pedestrians. Looking north on Sumneytown Pike, now five lanes wide. After nine months of construction, the road reopened on Friday, December 10, 2010 at 11AM. 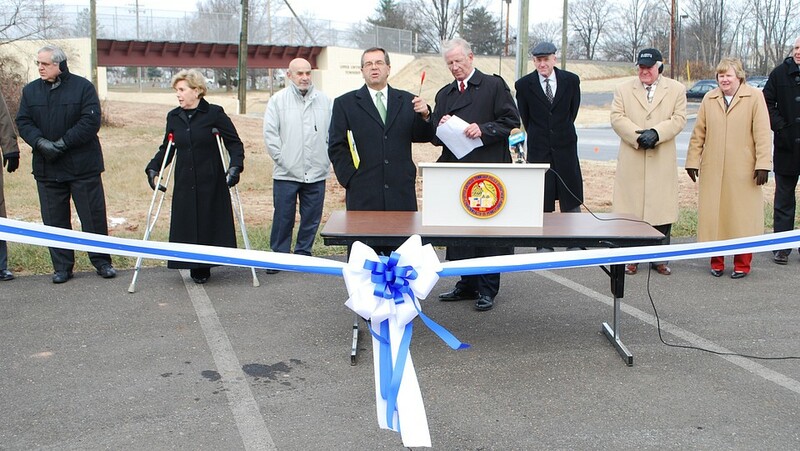 In this photograph Township Manager Len Perrone speaks at the bridge dedication. Behind him are some of the Township Commissioners, as well as State Representative Kate Harper. 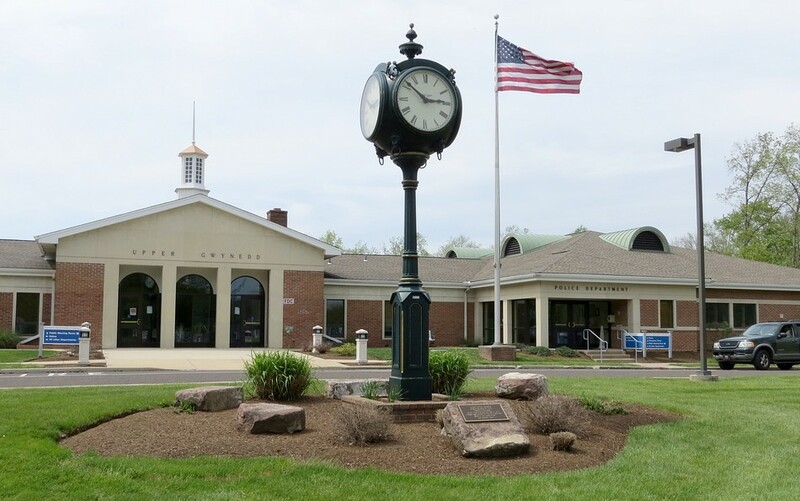 Len called the completed project the satisfying accomplishment of his 21-year career as Upper Gwynedd's lead administrator. "It is frequently said that a journey of a thousand miles begins with one step," Perrone said during the ceremony. "By definition, that means the journey also ends with a last step. This is our last step in a really incredible journey that started 17 years ago." 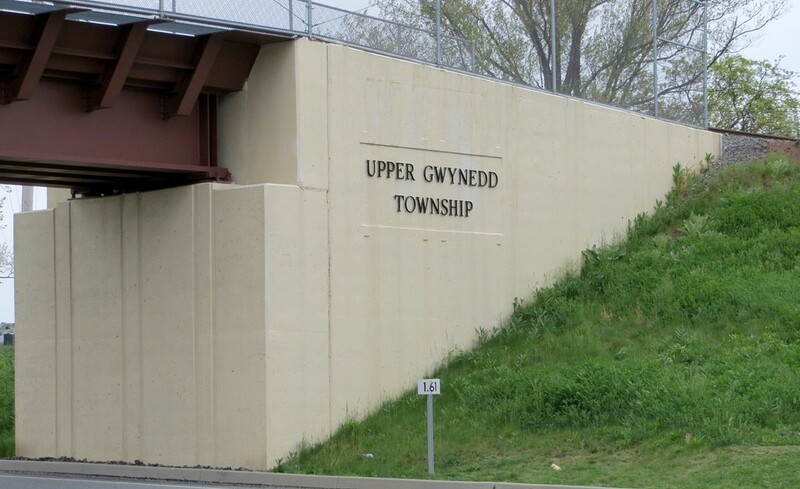 Upper Gwynedd Township spent 8.5 million dollars on the project. Montgomery county contributed 4.3 million and Merck contributed 3.2 million dollars. 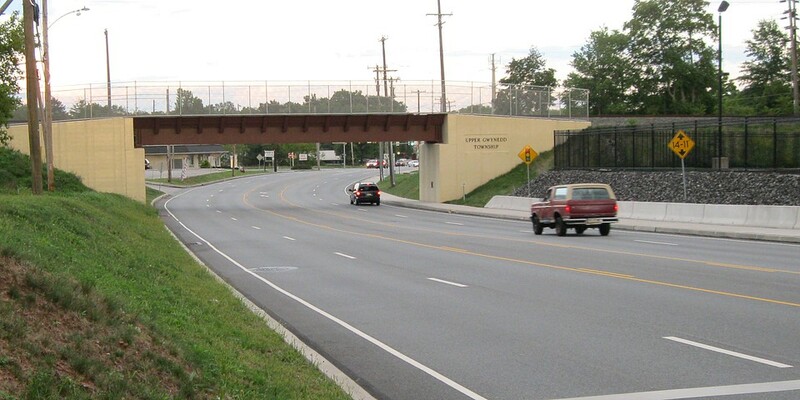 The bridge was designed by AECOM, and earned the first-place award for short-span projects from the Pennsylvania Association for Bridge Construction and Design. 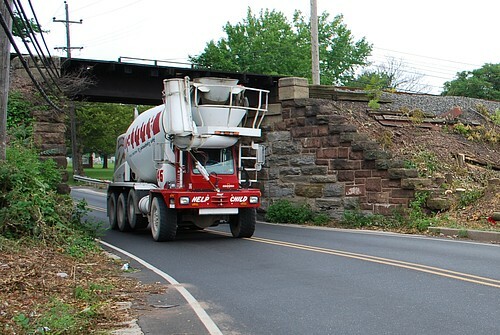 CSX Transportation, which operates the rail line, and SEPTA, which owns the bridge, contributed as design partners. The actual construction was done by the firm of Allan A. Myers. 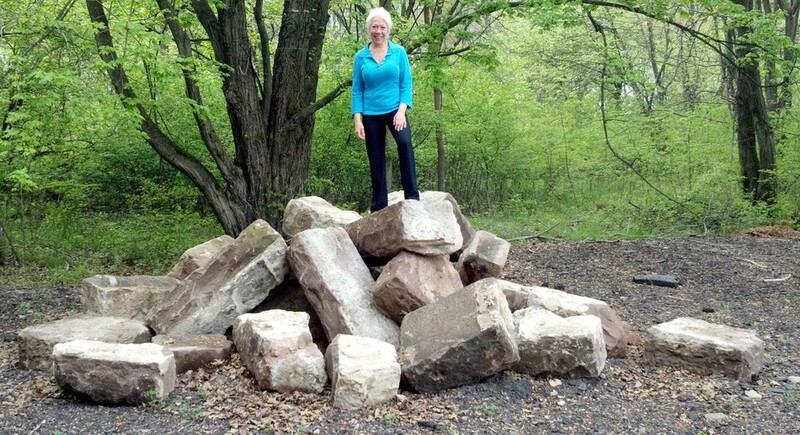 Some Upper Gwynedd residents regretted seeing yet another piece of history disappear. 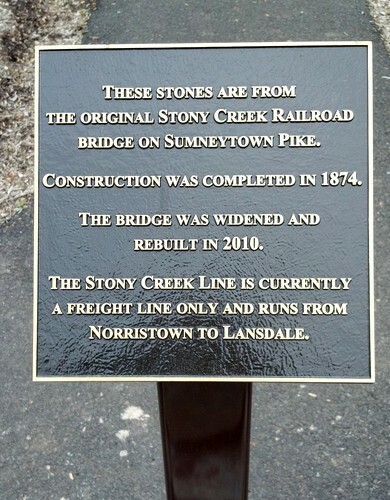 Bruce Knoll of West Point asked Len Perrone if some of the stones from the old bridge could be saved. In this photo from April 2012, they are being stored at the rear of a parking lot used by the township. 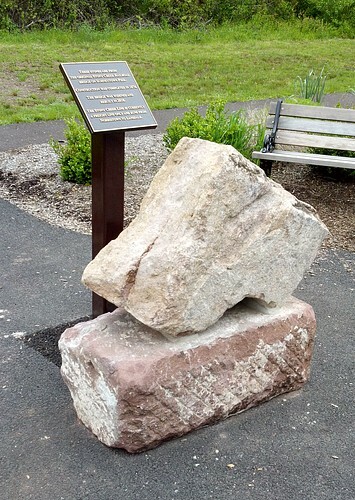 These stones are displayed in a small garden along the walking path at Parkside Place. Others are prominently on display in front of the township building. Next, some pictures of the new bridge construction.